Our Peaceful cottage rooms are complete with kitchen with cooking facilities. Ideal for long-stay guests. Suitable for long stay & family! We also have one hideway room in one building with a pleasant private space! This is one cottage room in one building! The private space makes you relax and comfort as you wish. 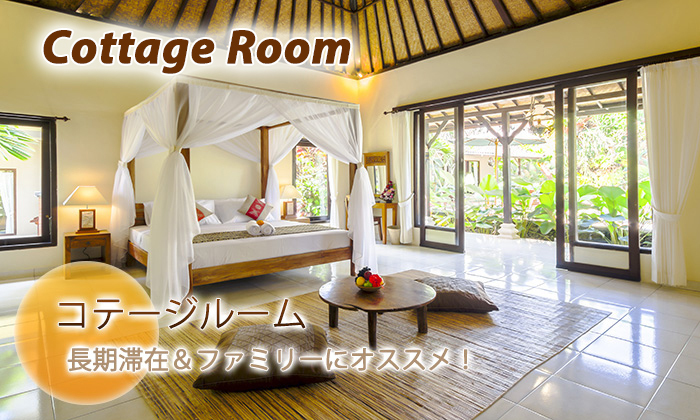 This features a typical Balinese high ceiling and its decor is a contrast of white and brown that is pleasing to the eye and creates a sense of relaxation. There is also a fully equipped kitchen for self-catering. As mentioned, it is especially ideal for longterm stay and families. Please have a pleasant time cooking with Balinease ingredients and enjoy the meal on the terrace!